The World Wide Web offers an amazing array of information, sometimes overwhelming, but always fascinating. Although my list might be endless, these are a few of my top favorites that I wish to share with you for this year. While autographing books a few years ago at a trade show in Denver I was approached by a woman who introduced herself as the founder of cancergifts.com. Intrigued I asked more. Xochi (pronounced So-she) Hughes is a cancer survivor. In her recovery process to find meaning in her disease she decided to start a company that created gift baskets for cancer patients. The result, www.cancergifts.com proved to be a overnight success. Xochi has retired at the end of 2005 and sold the business to Tami, but the integrity remains. If you know of somebody who has cancer and you wish to express your love or healing energies but not sure how, consider visiting www.cancergifts.com. To honor my friends and colleagues, I would like to highlight their careers through their web pages, as well as some pretty neat features. Many of my favorite websites include those from my favorite musicians. In no order of importance, because they are all special, I would like to introduce you to my friends. I will add more websites with each new update. I met Laura Nashman, a remarkable flutist from Canada , at a trade show in Colorado several years ago. She was gracious enough to gift me with her CD and I ended up using one of her songs in the soundtrack to Earth Prayers. 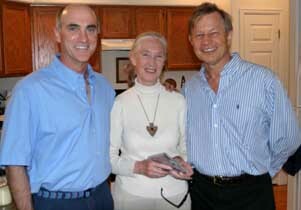 If all goes well, we will be using two of the tracks from her newest CD Seasons of Love for the new Jane Goodall CD/DVD project, giving it an international flavor. Please check out her website at www.spa-la-la.com.